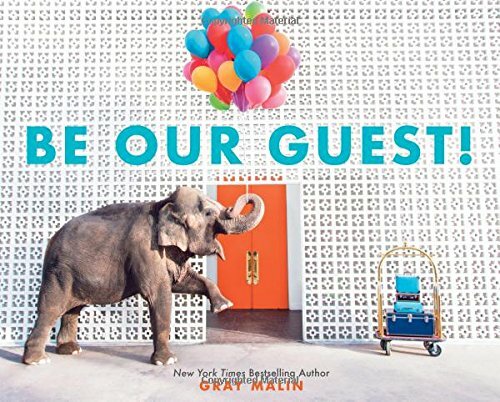 a book review by Cindy Helms: Be Our Guest! Strange and wonderful things await the visitors at the Parker Palm Springs Hotel in this photo collection assembled by Gray Malin. Malin is a fine-art photographer with Beaches and Escapes already on the New York Times bestseller lists. Be Our Guest! is his first book targeted to preschoolers. Maurice, the concierge monkey, narrates a pictorial tour as if the reader were checking into the hotel and needed some brief words of orientation. He introduces the owner, a lion named Mr. Parker, Wally the front desk kangaroo, the life guard penguins Peter and Pippa, and some special guests including Callie Camel and Timmy Tiger. Around the hotel are shots of the guest room, the pool area, common areas, a cafe, and the landscaped grounds, with the various animals posing for the photo as if to say, “cheese!” As Maurice shows off the hotel he is making puns and emphasizing certain words to highlight how much fun it is to be on vacation. What is terrific about this project is the sense of souvenir it provides. It is a beautiful production of what could be a family vacation photo album. Each photo is a creative, fantastically executed narrative of an exotic animal shot on location in unexpected human settings. The animals are expressive, majestical, stately and given tremendous personalities. The stunning elephant, Eliza, is actually caught on camera playing in a garden hedgerow filled with multicolored balloons—a photo so exquisite that the reader will truly want to stay overnight, on this page alone. Malin stresses that he worked with a highly reputable and ethical animal organization and followed all safety protocols during their time on set. These animals were indeed physically on location. There is no photoshopping going on here. There really is a camel in the guest room hallway, a pig (Pierre, the pastry chef) standing on a table full of enticing sweet delicacies, and a zebra trying to play hide and seek behind a tree trunk. Also, it is important for some reason that there be a party about to happen, because no hotel vacation is complete without one, but a party never quite manifests. The reader “checks out” before a group gathering ever arises. This sort of copy offers mixed results. It does fit the overall scrapbook concept and is typical of the loose commentary one might write among their own family vacation photo album snap shots. However, in most cases, family albums are only meant to be viewed by family members and friends who are able to fill in the gaps with actual first-hand memories, and not for an audience of, hopefully, thousands of readers. In this case, the text is but fluff and does not add much value. The commentary leaves more gaps than it fills. It actually hurts the overall success of the book, which in the end is little more than pictures strung together trying to find a narrative to coincide. Overall, Malin’s photographs shine all on their own. They say all they need to say and Be Our Guest! is delightful and original.